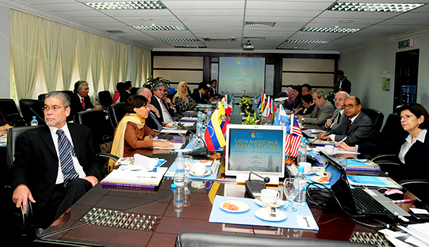 BANGI, 28 Feb 2014 – The National University of Malaysia (UKM) has proposed that Latin America’s top universities seek recognition from the Malaysian government to enable better cooperation and students and staff exchanges between them. Deputy Vice-Chancellor (Academic and International Affairs), Prof Ir Dr Riza Atiq Abdullah O.K. Rahmat said UKM eventually hopes for a mutual recognition of courses or credit hours between them on selected curricula. Speaking at a meeting with representatives of the Latin American and Caribbean Embassies in Malaysia on future collaboration between them here today, Prof Riza Atiq said UKM had already forged several partnership programmes with Latin American nations, such as the mobility exchange with a Mexican university and the Simon Bolivar Public Lecture series with Venezuela. UKM and Latin American universities can go further by mutually allowing students to transfer from each other universities without losing out on credit hours, he said. Prof Riza Atiq said that UKM is also interested in having trans-regional studies with Latin American institutions and not just mobility exchanges with Mexico. However there are so far no mechanisms for credit hours recognition as yet. The proposal was unanimously agreed to by all those attending the meeting organised by the Institute of Malaysian and International Studies (IKMAS). The ambassadors of Mexico and Colombia, Carlos Isauro Félix Corona and Rodrigo Querubín Londoño respectively offered intensive courses in Spanish for Malaysians wishing to continue their tertiary studies in Latin America saying that the main barrier to foreign students is fluency in Spanish. Corona said his country is not yet a familiar destination for Malaysians wishing to study abroad but some headway has been made through student exchanges and mobility programmes with UKM. He said anyone wishing to enter a university in Mexico must be proficient in Spanish and attend the language and cultural courses first before starting. He cautioned that the Spanish language to be learnt should be as close to the dialect of Central and South America as possible, rather than the formal language used in Spain. Head for IKMAS’ Centre of Latin American Studies Dr Zarina Othman said UKM is trying to get the government interested in providing funding for native Spanish speakers to be language instructors for students going to Latin America. IKMAS Director Prof Dr Rashila Ramli also attended the meeting.